The Nokia 5.1 Plus will be available in India through retail stores starting Tuesday, January 15. The Nokia 3.1 Plus does not have Nokia's glass sandwich design, instead, the company had opted for an Aluminium panel with 2.5D curve. Both Nokia 5.1 Plus and Nokia 6.1 Plus notably debuted in the Indian market offline-exclusive models - available through Flipkart and online Nokia store. To recall, the Nokia 5.1 Plus was launched in India late last October with a price tag of Rs. 10,999. With the new price cut, the Nokia 3.1 Plus is now the cheapest Nokia smartphone that is part of the Android One program. 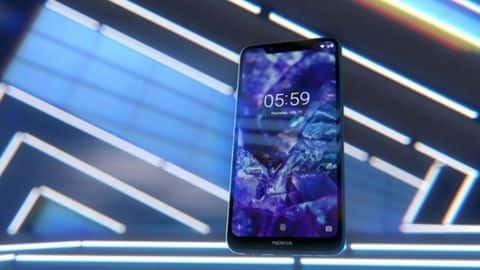 HMD Global, the company which holds the license to manufacture Nokia branded smartphones, launched the Nokia 3.1 Plus in October previous year. This pricing was obviously questioned because Nokia 5.1 Plus that can be considered as as an upgrade over the Nokia 3.1 Plus in the Nokia product range is priced lower at Rs 10999. The Nokia 3.1 Plus sports a 6-inch HD+ display with a 18:9 aspect ratio. In the camera department, the device comes with a dual-camera setup on the back with a 13-megapixel primary sensor, and a 5-megapixel secondary sensor for depth sensing. The Nokia 3.1 Plus is powered by an octa-core MediaTek Helio P22 processor coupled with 2GB/3GB of RAM. The device comes with a microSD card slot so that users can use a microSD card with up to 400GB in capacity to expand the storage if they are running out of storage space. Nokia 3.1 Plus comes with a 13MP/5MP Dual rear and 8MP front cameras. Consumers interested in an Android One device under Rs 10,000 can consider the Nokia 3.1 Plus now. In terms of connectivity, the smartphone has 4G VoLTE, Wi-Fi 802.11ac, Bluetooth v4.2, GPS/ A-GPS, USB Type-C (v2.0), and a 3.5mm headphone jack. The device has all the essential sensors such as ambient light sensor, proximity sensor, accelerometer, gyroscope and others.